First Job After Graduation: Riding Instructor, Sale Horse Prep Rider and Barn Worker at Carolina Sport Horses in Westminster, SC. 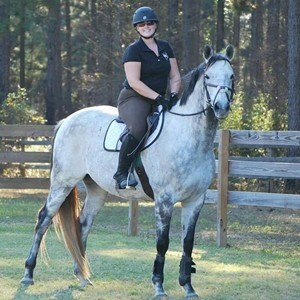 Barn Manager / Trainer / Riding Instructor / Rider at Terra Chula Plantation in Quitman, GA. 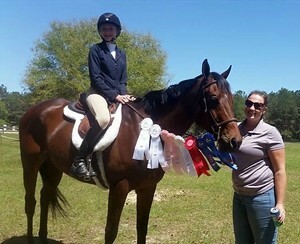 I manage all aspects of the barn including four hunter and dressage show horses and five quail hunt horses, oversee employees, take students to shows and teach lessons. The whole experience was a great memory! Grasping the basic skills as a dressage rider was huge for me, to understand the whole inside leg to outside rein concept is a skill I always use! I love it when a client comes to me saying that there horse is so strong when being ridden that they have to be riding in some harsh shank or leverage bit, then when I switch over to a snaffle and after a few lessons working on their seat and leg the horse just transforms! I loved a few horses from my time there, one of which was the cutest little red head, RedCloud. That horse gave me so much confidence and taught me so much. I miss that guy! In some ways attending Meredith Manor made me have to prove myself, not in a bad way, but I didn't want people thinking that just because I went there that I had an attitude that because you graduated from MM you are better than everyone. So It made me set a standard for myself and skills to show people that I had what it took to do the job because I attended there. I was only 18 when I enrolled. I moved to WV with my husband to attend MM. Being so young, I didn't necessary have the social skills I needed for real world experiences, so of course being there helped with that. Made a few friends along the way. It just opened my eyes to the whole horse industry, got me started in the direction I needed to go. My advice would be to go in with an open mind. When I attended, I basically didn't know anything so I didn't have any set ways that I was doing things. You get out what you put in with this program. Be prepared to work hard and learn a lot. Don't expect to graduate thinking you know EVERYTHING either, you don't. There is always more to learn from every place you work and experience, good or bad. For me, it was the best option for what I wanted to do with my life. It kick started my career, but didn't automatically put me in the ideal positions the first few years. I took many jobs as a rider, trainer, barn worker, groom, and instructor since graduation in 2008. It has been all about the journey, everything leads to your goal. Because of my mindset with this, I believe that is how I have found the wonderful job I currently have which, without those prior experiences and attending Meredith Manor, I would not be prepared for. The manor was the best experience I have had in life. The instructors explain everything in detail and have a theory reason for the "why" in riding. I have developed riding skills far past what I thought I would be at thanks to the great instruction at the manor. Highly recomend it!